Find everything you need for a great party in Hawkes Bay. We can help you plan and book your party or a weekend get away. Hawke's Bay is one of the New Zealand's leading producers of wine; this region is located on the east coast of New Zealand's North Island. It is loved by tourists for its sheltered coastal plains, sunny climate, long-established vineyards and fabulous beaches. The Hawke’s Bay is acknowledged on the world stage for its award-winning wines, this region is made up of Hastings, Napier, Wairoa, Havelock North and Waipukurau. Hawke’s Bay is accessible by air, land and sea that makes getting to the region quite easy. But the fastest way to get to the Hawke’s Bay is by air. Other options can be explored depending on your location and destination; like vehicles can be used if you are moving within the twin cities of Napier and Hastings. Hawke’s Bay has good transport system, you can choose taxi or take public transport. Their taxis and buses run day in day out. For wine lovers the best time to visit Hawke’s Bay is during the 10-day festival - Food and Wine Classic (FAWC) held annually during Spring time. This is a 60 year old event and includes cooking classes with celebrity chefs, beer and wine tastings and it also allows the attendees to get up close and personal with the winemakers and chefs. experiences: the Landscape Ride, the Water Ride and the Wineries Ride. 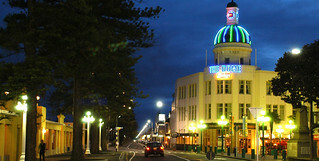 Sport or activity Hawke’s Bay is known for Hawke’s Bay offers lots of fun filled activities for tourists seeking thrill. Tourists can indulge in horse riding, rafting, kayaking, aerial thrills and so much more. You can go on Bay Heliwork, On Track Adventures, enjoy Hawke’s Bay farmyard zoo, Mohaka Rafting, New Zealand Game Birds, Kaweka Hunting, Gannet Beach Adventures and so on. Napier and Hastings boast of fine wines from more than thirty vineyards open for wine tasting. Some even offer alfresco and restaurant dining. If you do not enjoy driving, cycle from one winery to the next along one of the three Hawke's Bay Trails on a hired mountain bicycle. 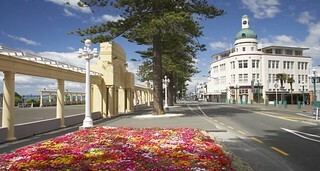 It is Napier's annual art deco festival which is held every February; it features old historic cars, music bands, a plane swoop, art-exhibitions and other entertainment. The home of New Zealand's first themed water park is Hastings, it features the on-ending river ride, the double dipper 2 persons tube ride, the pirate fortress pool with cannons and , the sky castle screamer. You are set for a great time here. Mission Estate Winery at Taradale or try The Silky Oak Chocolate Company & Café at 1131 links Rd.If you are in Hastings, check out Ash Ridge Wines or visit the Te Awa Winery. The Puketapu and so on…. It would be fun if you visit a different one each night you spend in Hawke's Bay.